In week three of the Women’s Premier League (WPL), the closest game came down to Berkeley and Chicago North Shore. The All Blues traveled to the Windy City for the first of four-straight road games, and held off a tenacious North Shore for a 36-29 win. The visitors took a 12-0 lead after 15 minutes, scoring through fullback Serena Liu and outside center Evan Hoese, who ended the day with three tries. Flyhalf Sam Miller added the first of three conversions. Berkeley scored a third first-half try when No. 8 Kedra Davis touched down, but not before Lindenwood graduate Laura Enk crossed for five. Fellow WPL newcomer Jessica Ventrillo followed with a try before the halftime whistle, and Berkeley held a 19-10 lead. Enk opened up the second half with a second try, and Gabby Whittinghill’s conversion pulled the scoreline to 19-17, Berkeley. The next score was the crucial one – would North Shore take the lead or would the All Blues regain momentum – and that question was answered through Davis, and then Hoese, 29-17. But there was still the whole fourth quarter to play, and North Shore ran in another two scores from outside center Nicole Fisch and reserve Bridget Kapinus. Hoese’s hat trick, however, gave Berkeley the margin it needed for the win. Although North Shore took the loss, the home side earned two bonus points in the standings. On the other side of the Blue Conference, Glendale made solid strides after an opening-round loss to San Diego, and traveled to ORSU for a 46-14 win. Prop Melissa Polheber initiated the scoring minutes into the match, and flyhalf Hannah Stolba kicked the first of three conversions. ORSU flanker Rachel Johnson dotted down for a fourth try this season, and flyhalf Emma Richie’s conversion tied it all up after 12 minutes. Ten minutes later, the Merlins kicked off a seven-try run that spanned the remainder of the match, seeing Stolba, Madison Slaught twice, Allison Hale, Charlotte Thompson, Sam Luther and Joanna Kitlinski across the try line. The game ended with a try from Jesters reserve Beckett Royce and Richie conversion. The Merlins will play its first home game on Saturday against 3-0 Berkeley, while ORSU gets the bye week. 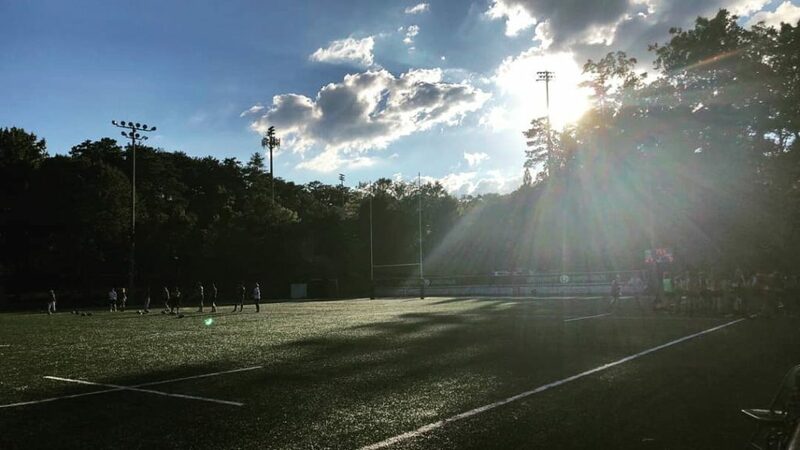 In the Red Conference, Atlanta won its first-ever WPL game against Twin Cities, defeating the visiting Amazons 53-10 on Saturday. One such example is recent Life University graduate Darian Lovelace, who served as Atlanta’s field captain against Twin Cities. The No. 8 took advantage of the WPL waiver last year, along with a handful of other collegians around the country, to sample the elite senior league. Kaitlyn Broughton, also a spring 2018 Life University graduate, opened Saturday’s scoring five minutes into the match and ended the day with three tries. Lovelace also praised the work of Central Florida grad Cortney Kuehl, who added two tries, and WPL first-year Chidinma Chukwueke, who scored from the wing. The field captain was also impressed with Akilah Guzman, the Kennesaw State standout who made her WPL debut at scrumhalf Saturday. Jenna Grygier, Laketa Sutton and Mo Compito also scored tries, while Compito, Alice Plant and Corinne Heavner split kicking duties. Wagner also credited Saturday’s win to the team’s focus on defense, and those efforts paid off against the always physical Amazons. Lovelace lauded prop Lanoira Duhart, scrumhalf Rachel Lentsch and inside center Maria Bowker for their stellar performances, and lock Shaena Sparrow scored both of the Amazons’ tries. Fulbrook, Maggie Myles, Nate Serevi, and former/current 15s Furies Lauren Rhode and Dana Meschisi. The rest of the first half belonged to New York, which sent wing Sarah Levy into the try zone three times and added a Nikki Richardson conversion. Misha Green and Shamira Robles scored back-to-back in the second half, 27-5, before D.C. kicked off its rally. The Furies responded with tries from Lauran Glover, Fulbrook and Meschisi, and Rhodes’ conversions pulled D.C. to within three, 27-24. With 12 minutes remaining, New York regained controlled, as Kristen Siano added a penalty kick, and then Levy crossed for another two tries, converted by Siano, for the 44-24 win.